Taking a break from the boards for the next few months to record two new Audiobooks. S.I. Taylor’s The Scarlet Romance: A Greek Paranormal Series is a fantasy romance novel reimagining the Greek gods living in our modern era. A great conspiracy is uncovered among the gods of Olympus, and it is up to the god of the underworld to put the pieces together in hopes of bringing an eternal war to a peaceful end. For lovers of fantasy, romance, the paranormal, and Greek mythology. Clyde Dowell II’s That There Las Vegas! tells the story of three groups of friends: The Dogleggers, The Brothers, and The Cali Boys, in a literary love letter to America’s most sinful city, Las Vegas. Following their hilarious escapades the story reflects on the value of friendship… in the face of A LOT OF ALCOHOL. I’m having a great time in the booth with these two wildly different stories. They will available on Amazon, Audible, and iTunes in late Spring! Michael Brusasco’s Brutus is both idiosyncratic and very effective. He’s demonstrative, intimate with the audience, not the cool Stoic we often see. At his superb soliloquy in Act 2, Brusasco got a few tart chuckles at many lines, such as “Th’abuse of greatness is when it/ Disjoins remorse from power.” He has high standards: “Let us be sacrificers, not butchers. … Let’s kill him boldly but not wrathfully. … Our purpose necessary and not envious.” Admirable, but naïve, standing on principle when all about him are simply settling scores. From the outset, there is a querulous note to this Brutus. When fortune goes bad, he fairly screams at Cassius in his tent, surely a divergence from the classical, staid cool of many Brutuses. He also maintains a slight, ironic smile, as when he sees all is lost. This Brutus is never totally sure of himself and will stand up to all consequences. This Brutus is more tragic, more to be mourned. This is a Julius Caesar worth seeing, raising all the conflicted issues that have engrossed and appalled audiences for centuries, not least our own. ...he’s just a bungler, a mediocre white guy. "...Michael Brusasco nails the pomposity and entitlement of Wessex, Viola's intended husband.."
"mercantile marriage to Wessex (Michael Brusasco, deliciously pompous), a tedious man only wanting her money for his tobacco plantations in Virginia." "...stand-out performances include: Michael Brusasco's slimy turn as the Duke of Wessex..."
Check out my interview with Cincinnati Play House where I discuss what makes me so slimy, tedious, pompous, and entitiled! The beloved, Oscar-winning film comes to life onstage in an extravagant production that’s both wildly funny and irresistibly romantic. Young Will Shakespeare has writer's block... the deadline for his new play is fast approaching but he's in desperate need of inspiration. That is, until he finds his muse – Viola. Against a bustling backdrop of mistaken identity, ruthless scheming and backstage theatrics, Will’s love for Viola blossoms and inspires him to write his greatest masterpiece, Romeo and Juliet. Critically adored after its premiere on London’s West End, this exuberant romantic comedy will make you believe in love above all. This will be the third time I've worked with director Blake Robison, and I'm thrilled to return under his guidance. What's even more exciting is my wife, Emily Trask (pictured above), will be playing the lead! Buckle up. It’s going to be a bumpy ride. Li’l Bit takes us on a no holds barred trip back in time to her adolescence in 1960s Maryland and her complicated relationship with an older man. A deeply compassionate look at how we are shaped by the people who hurt us, How I Learned to Drive masterfully veers in and out of personal memory and deftly traverses comedy, drama and farce. CPH Artistic Director Laura Kepley steers Paula Vogel’s Pulitzer Prize-winning contemporary masterpiece. DRIVE is a co-production with Syracuse Stage. Performances in Cleveland are March 4th - 26th and April 5th - 23rd in Syracuse. What one needs to appreciate is this: we shot a Fall collection on one of the hottest days of the year in Houston. In the pic above, the room which was part of retrofitted silo space, had to have been at least 105 degrees. Needless to say, there was a team of people just off camera ready to keep the sweat from pouring down my face. It was a wild day, but happy with the shots they produced. Click here to learn more about Houston CityBook! What a wild ride we enjoyed as the cast and crew opened this amazing play last night. Thanks to all involved, and thanks to all who came and enjoyed the show. We run until Sept 18th, so if you are in the Houston area, come and check us out!!! Artistic Director Gregory Boyd announces the cast and creative team for Robert Askins' Tony-nominated play Hand to God, which opens the 2016-2017 Season on August 19 in the Neuhaus Theatre. A smashing success on Broadway and now in London, this fast-paced dark comedy is the Texas playwright's Alley debut. Hand to God is directed by Mark Shanahan and features Alley Company members. Tickets are on sale now at www.alleytheatre.org. "Hand to God is a serious comedy that marries outrageousness with real depth of feeling and a did-he-really-just-say-that hilarity. It's exhilarating and alarming - angry and unsettling - and painful and ultimately moving. We are all thrilled to be making a production of Texas playwright Robert Askins' play and of celebrating his Alley debut and of welcoming this Cypress native back 'home'," said Boyd. In Hand to God, The Devil is lurking in a church basement puppet show in Cypress, Texas. And his name is...Tyrone. He may look like an innocent sock puppet, but when he infiltrates the angst-ridden church youth group and takes possession of Jason's arm, all Hell breaks loose. Spectacularly foul-mouthed and wickedly scandalous, Tyrone shocks the congregation with his outrageous insinuations, exposing their deepest secrets-and teaching us all about what it means to be human. The Hand to God cast features Steve Pacek (Arden Theatre: The Secret Garden, Metamorphoses) as Jason, Michael Brusasco (Spider's Web, All the Way) as Pastor Greg, and Alley Company members Elizabeth Bunch (Grounded, Born Yesterday ) as Jason's mom Margery; Emily Trask (One Man, Two Guvnors, Around the World in 80 Days) as youth group member Jessica; and Jay Sullivan (Born Yesterday, Around the World in 80 Days) as youth group member Timothy. Hand to God is directed by Mark Shanahan, who recently directed the Alley's production of Around the World in 80 Days, and co-directed Sherlock Holmes and The Adventure of the Suicide Club. Shanahan has also performed in Alley productions of The Hollow, Harvey, Treasure Island, Tryst, Hitchcock Blonde, Witness for the Prosecution, and Journey's End. Robert Askins was born in Cypress, Texas. His Tony-nominated, Obie Award-winning play Hand to God recently ran on London's West End (Olivier nominated for Best New Comedy) after it opened on Broadway in April 2015, following two critically-acclaimed runs at EnsembleStudio Theatre and MCC Theater, where it was named a NY Times Critics' Pick and called "the most entertaining show of 2014." Askins is an I-73 and Youngblood alum and a graduate of Baylor University. He's currently at work on two feature film projects and an original comedy series for HBO. The play features scenic design by Kevin Rigdon (The Nether, As You Like It), with costume design by David C. Woolard (Toxic Avenger; Broadway: Dames at Sea), lighting design by Paul Whitaker (Grounded, Other Desert Cities), and sound design by David Budries (Broadway: Souvenir). Hand to God begins preview performances at the Alley Theatre on August 19, opens August 24, and continues through September 18, 2016 in the Neuhaus Theatre. Hand to God contains explicit language, profanity, sexual situations, and very rude puppets. Mature audiences only. Tickets to Hand to God are on sale now and start at $26. Discounted tickets are available or any student, regardless of age, with a valid student ID for $16 for designated performances in designated sections. Tickets can be ordered online (alleytheatre.org) or by phone (713.220.5700). Discounts are available for groups of 10 or more. Summer Chills is upon us at the Alley Theatre in Houston, Texas. Avoid the dank and sweaty outdoors of the Buffalo Bayou and bring your British sensibilities to the Hubbard Stage for an evening of crime, murder, and mystery. This is a rarely produced Christie. For those of you familiar with her work, you will recognize her brilliance in creating theatrical suspense, provoking imaginations young and old. This is a chestnut you actually want to see. SPIDER'S WEB runs July 12 thru August 14. Reviews for DTC's Deferred Action are in! DEFERRED ACTION runs at Dallas Theater Center until May 14th. Congratulations to the cast and crew of DEFERRED ACTION, a new play by David Lozano and Lee Trull at the Dallas Theater Center. The world premiere of DTC’s collaboration with Cara Mía Theatre Co., Deferred Action focuses on Javier Mejía, one of the immigrants known as Dreamers who arrived in the USA as an undocumented minor. Now, after years in the States, he finds himself caught in the tangle of existing immigration laws, new presidential policies and the harsh reality of living in the shadows. Javier hopes that temporary administrative mechanisms like Deferred Action will be the answer to his dilemma. But will hope be snatched away? Can politicians who say they are the Dreamers’ friends be trusted? Deferred Action follows the lives, loopholes, and dangers of those who dare to dream. I was a last minute addition to the cast, learning one of the lead roles in just under 7 days. It was an incredible challenge: I am proud of all the work this group has done. If you are in the Dallas area, come check it out! Wow. Texas. You do early votiing. Good thing because the wildly successful production of ALL THE WAY at the Alley Theatre moves to Dallas Theatre Center on March 1st. We'll shut the doors for a few days, iron out the kinks, reset some quick changes, and be ready to preview on March 3rd. Check out the DTC website for more info! Alley Theatre, which is readying its production of All the Way, the Tony Award-winning play about President Lyndon Baines Johnson, has announced that actor James Black has had to withdraw from the production in order to undergo medical treatment. Actor Brandon Potter will take over the role of LBJ and all performances will continue as scheduled. Mr. Black is expected to fully recover. All the Way begins January 29 in the Hubbard Theatre at 8:00 p.m. and continues Tuesday through Sunday until February 21. The play, by Pulitzer Prize-winning playwright Robert Schenkkan, is a vivid and exciting dramatization of LBJ's tumultuous first year in office. In addition to Potter, Michael Brusasco joins the large cast as Gov. George Wallace, alongside previously announced cast members Shawn Hamilton as Rev. Martin Luther King Jr., John Tyson as Sen. Richard Russell, Chamblee Ferguson as Sen. Hubert Humphrey, Kieran Connolly as J. Edgar Hoover, Leah Spillman as Lady Bird Johnson, Hassan El Amin as Roy Wilkins, and Chris Hutchison as Robert McNamara. A full cast list follows below. Brandon Potter has appeared in Dallas Theater Center's A Christmas Carol, Sense and Sensibility; The Book Club Play; and King Lear. 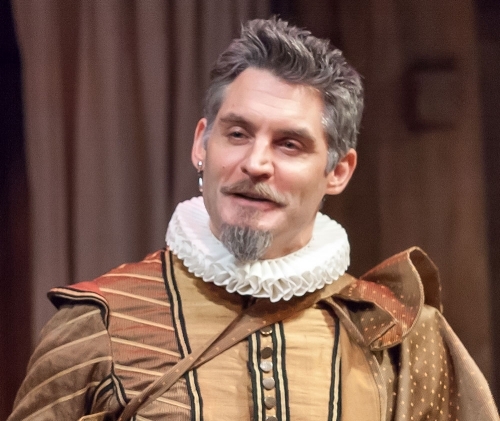 Michael Brusasco has appeared at the Alley in A Christmas Carol, Cleveland Playhouse's Venus in Fur and Berkeley Repertory Theatre's Much Ado About Nothing. The production is a collaboration between Alley Theatre and Dallas Theater Center, and is directed by DTC Artistic Director, Kevin Moriarty. The All the Way creative team includes Scenic Designer Beowulf Boritt, Costume Designer Jennifer Caprio, Lighting Designer Clifton Taylor with Original Music & Sound Design by Broken Chord. Winner of the Tony Award for Best Play, All the Way, paints a gripping portrayal of LBJ, civil rights hero, ruthless bully, and perhaps one of our greatest legislative presidents. With a title harkening back to the slogan for his 1964 campaign, All the Way is a searing and enthralling dramatization that explores political gridlock, strong-arm manipulation, and the morality of politics and power. Variety describes the play as a "sprawling, heady and thoroughly gripping drama..."
All the Way begins performances at the Alley Theatre on January 29, opens officially February 3, and runs through February 21, 2016. After its run in Houston, All the Way moves to the Dallas Theater Center where it begins performances March 3, opens officially March 5, and runs through March 27, 2016. TICKETS: Tickets to All the Way are now on sale and start at $27. Discounted tickets are available for any student, regardless of age, with a valid student ID for $16 for designated performances in designated sections. Tickets can be ordered online (alleytheatre.org) or by phone (713.220.5700). Discounts are available for groups of 10 or more. Following the February 9 (2:30pm) and February 13 (7:30pm) performances of All the Way, the Alley will offer a special Artist Talk-Back post-show event. The talk-back will feature actors from the production talking about their experience and process. The Alley Theatre will also present Alley In Context following the February 6 (2:30pm) and February 21 (2:30pm) performances of All the Way. These discussions will feature civic leaders, local academics, and community members discussing the themes of the play and how they are reflected in our lives today. Artist Talk-Backs and Alley In Context are free and open to the public. Went on last week as Marley in the Alley Theatre's Christmas Carol. Never wore so much makeup before. My first body mic as well. Had so much fun, but very thankful to be back in my original track. I tried Wordpress. It was a terrible experience. How do I even begin to describe the kind of irritation I went through to maintain my old site. I couldn't do it. So now I'm over here at Squarespace, hoping that the interface will be easier to use.